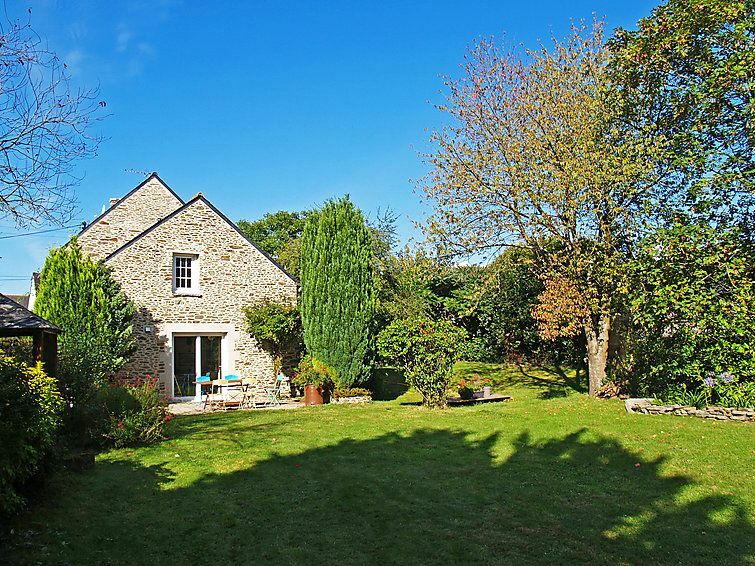 Languenan: Beautiful single-family house "this property", 2 storeys, surrounded by fields. Outside the resort, 2 km from the centre, 12 km from the sea, 12 km from the beach, in the countryside. Private: garden (not fenced) with lawn 1'500 m2, wildlife garden. Grocery 8 km, supermarket 8 km, shopping centre 8 km, restaurant 12 km, sandy beach "Saint Jacut de la Mer" 12 km. Nearby attractions: Dinan 10 km, Vallée de la Rance, St Malo 27 km, Cap Fréhel 34 km, Mont St Michel 58 km. Please note: car recommended. Object suitable for 6 adults + 3 children. 5-room house 150 m2 on 2 levels. Large living/dining room 25 m2 with open-hearth fireplace, TV, hi-fi system and DVD. Exit to the terrace. Open kitchen (4 hot plates, oven, dishwasher, microwave, freezer, electric coffee machine). Exit to the garden, to the terrace. Shower, sep. WC. Electric heating. Upper floor: 1 children's room with 1 bed (90 cm), 1 pull-out bed (2 pers. 2 x 90 cm). 2 rooms, each room with 1 french bed (160 cm). Gallery with 2 beds (90 cm). Bath/shower, sep. WC with corner bath. Terrace 20 m2. Terrace furniture, barbecue. View of the garden. Facilities: washing machine, dryer, children's high chair, baby cot for up to 2 year olds. Internet (WiFi, free). Reserved parking at the house. Suitable for families. Maximum 1 pet/ dog allowed. From the single room and 1 sofa bed, access to the gallery with 2 beds, via stairs.